An inguinal hernia may present as a scrotal mass secondary to loops of bowel within the scrotum. Exam will reveal peristalsis of the scrotum and auscultation will reveal bowel sounds. Direct inguinal hernias result from an acquired weakness in the transversalis fascia at Hesselbach's triangle, bounded by the inguinal ligament, the exterior border of the rectus muscle, and the inferior epigastric vessels, and the peritoneum rarely outpouches beyond the area of the external ring; thus scrotal involvement is rare. Indirect inguinal hernias may occur secondary to a patent processus vaginalis, which is mostly found in a pediatric population. 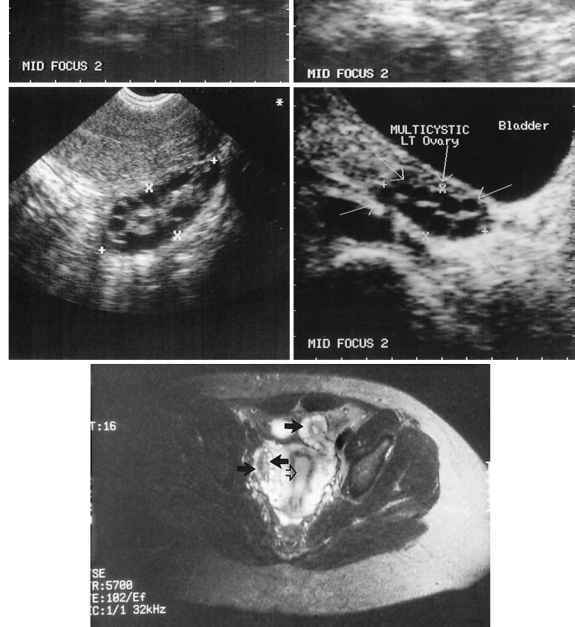 Indirect hernias in the adult are mostly protrusions of a new peritoneal process following the same path as the spermatic cord into the scrotum. Management is dictated by the characteristic of the hernia. Strangulated hernias will require urgent surgical exploration. Incarcerated hernias will require open surgical management or closed reduction under anesthesia. The accuracy of ultrasound in making this diagnosis is operator-dependent, and thus, operative repair should not be delayed if incarceration or strangulation of an inguinal hernia is suspected. Reducible hernias can be repaired on an elective basis.